This weekend we celebrated my dad’s birthday. When I asked him what he wanted, he said it didn’t matter. Birthday’s aren’t important to him because growing up they were never celebrated. To me that’s all the more reason to want to celebrate now. At the very least, a birthday needs a cake. I was eventually able to get a request for cake with pudding out of him. I had originally planned to make a chocolate pudding tart, but when my mom came home with raspberries those plans changed to a Charlotte. Charlotte’s are molded cakes filled with mousse or custard and surrounded by cake or lady fingers. They are relatively easy to make and look very impressive. I say relatively because I had a really, really hard time getting the Lady Fingers to stand up. I read several recipes from blogs, cook books, magazines, they all gave the same instruction: stand the lady fingers around the mold. None of them explained how to get them to stand. In the end I cut them in half to give them flat bottoms, making them more balanced. I filled the Charlotte with a layer of Grand Marnier flavoured pastry cream and another of whipped cream, then topped the whipped cream with raspberries. To tie the flavours together I dipped the Lady Fingers in a Grand Marnier simple syrup. The result was creamy and decadent; the raspberries added the perfect touch of freshness. Make the pastry cream: In a heat-proof bowl whisk the egg yolks with 1/4 cup granulated sugar. Whisk in the flour and cornstarch, the mixture should look like a paste. Set aside. Heat the milk and vanilla in a medium sauce pan. Heat till just before boiling (there will be some small bubbles popping up). Pour a small amount of the hot milk into the egg mixture and whisk to combine (this will temper the eggs). Pour in the remaining milk, whisking constantly. Return the custard to the saucepan, turn the heat to medium and whisk constantly until thickened. Stir in 1 tbsp Grand Marnier. Pour into a clean bowl, cover with plastic wrap then set aside to cool. Place the Lady Fingers: In a small sauce pan, heat 1/2 cup water with 1/4 cup sugar and 2 tbsp Grand Marnier. Let cool slightly. While cooling cut some the Lady Fingers in half, you will need enough to line the inside of a 9 inch springform pan. Lightly dip one Lady Finger in the simple syrup, then stand it up in the closed springform pan; the flat bottom of the cut Lady Finger should help it stand. Repeat until the entire rim is lined, then fill the base with dipped Lady Fingers. Pour the pastry cream into the springform pan. Refrigerate until set (about an hour). Once set whip the cream with the icing sugar. Spread on the pastry cream, then top with the raspberries. Refrigerate until ready to serve, then remove the springform mold. Ooo, good point about getting the lady fingers to stand up. I think you did the right thing. Certainly looks beautiful! My mouth is watering! I am so excited to make this! This is an elegant and I am sure, tasty dessert. Raspberries will not be around much longer and they are one of my favorites. Great info on the use of the ladyfingers. Your picture is stunning. Oh my gosh this is stunning… gorgeous…beautiful color. The lady fingers look perfect to me. Good idea to cut them. Well done. This is just beautiful! It sounds amazing too! Happy Birthday to your Dad!! What a fabulous dessert to celebrate with, and it just gorgeous! Such a gorgeous dessert! Great job, you have a lucky dad! Looks absolutely wonderful. 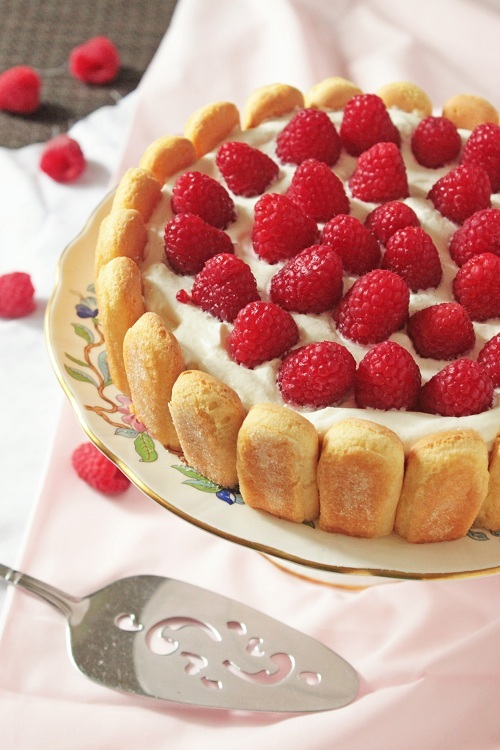 Raspberries are perfect for this dish! Charlottes are just so elegant! They will never go out of fashion. Yours with raspberry is just wonderful! Scrumptious and elegant! I adore that you are sharing your Dad’s birthday with us. Lovely post! Your charlotte is positively gorgeous! I have not been lucky enough to taste this creation before but it sure sounds delectable! I bet your Dad loved it. What I will miss are the peaches and neecarints. I haven’t frozen peaches for a long time–too much work and fuzz–but I sure enjoy eating them! I’ve frozen over 60 pounds of local blueberries again this summer, for my breakfast yogurt bowl each day through the winter. I also bought some pre-sliced strawberries from the local Rotary Club, and will have those as a special treat now and then. Yum! How beautiful! I’ll have to put this on my list to make sometime. This is beautiful. I’ll be your Dad any day if you’ll make me a cake like this for my birthday. Well, maybe not your dad but your BFF! This is one fantastically elegant cake! Just beautiful. Looks delicious! This is a beautiful birthday cake :) And I definitely agree… it’s not a birthday without a cake! Lucky dad! This is so beautiful. This is so beautiful, those little lady fingers make for such a pretty (and delicious) dessert! I do agree with all the ideas you have offered on your post. They’re very convincing and will certainly work. Nonetheless, the posts are very brief for newbies. Could you please prolong them a little from subsequent time? Thank you for the post. I tried your recipe. It was really delicious. Thanks a lot. I have a question. I doubled the recipe. I kept the cake to set for 2 hours in the refrigerator. But when we cut the cake it was soft and hard to serve the cake pieces to everyone. How can I make it more sturdy?